After spending an evening doing a 'first pass' of the Edinburgh Fringe programme, I can't escape the irony that a sequel to Macbeth with political allegories for present day conflicts is exactly the kind of show I'd run a mile from. 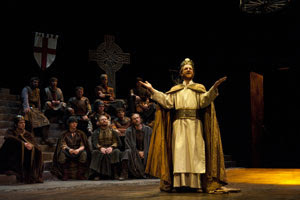 Yet Dunsinane is the best piece of theatre I've seen in months. But then, in fairness, those Fringe shows don't have the pedigree of a writer like David Greig attached to them - or the logos of the RSC and NTS on their adverts. Despite being aware that the play had been well received on its initial run in 2010, I'd avoided reading much about it in advance - so its comedic tone and contemporary language came as a bit of a (pleasant) shock. Although I must confess that my puzzlement as to how exactly Lady Macbeth ('Gruach' as she is here) was still around, did require a pre-show check of her fate in Shakespeare's tale. But I needn't have bothered as Greig quickly explains her 'resurrection' with a rather ingenious bit of 'retcon'. He also creates a wide scope for the play, letting the audience engage with both the high level political machinations and the soldiers whose lives are affected by them. Jonny Phillips excels as Siward, the English general tasked with securing the throne for Malcolm (and a peaceable neighbour for England). Even when his character crosses all kinds of lines, Phillips gives him a nobility that keeps the audience with him. Siobhan Redmond's Gruach coalesces her character's playful and steely aspects beautifully while Brian Ferguson gives Malcolm enough ambiguity to leave us wondering if the weak King is in fact a master manipulator. Tom Gill gives a wonderfully engaging performance as the young soldier (who also serves as narrator) and Alex Mann as Egham delivers many of Greig's best lines with a perfect sense of comic timing. And I could go on - the whole supporting cast deliver in every role. The contemporary 'message' about the dangers of nation building bleeds through the play, and there are only one or two occasions where it feels slightly heavy-handed. Waldorf felt the final scenes didn't provide the ending the piece deserved, but for me it worked well. So much so, that as a whole I don't think I've seen a better 'traditional' 'proper' 'on-a-stage' piece of theatre. Ever. And that's probably where this post should end. But that would ignore a significant element of how I felt about Dunsinane. An aspect that required me to make a conscious decision to flick an 'ignore' setting in my head during the show in order that I could enjoy it. Much of the humour, particularly in the first act, is at the expense of Scotland and the Scots. It's genuinely laugh-out-loud funny and the Scottish audience enjoyed the opportunity to laugh at themselves. And that's where I have a problem. For despite the National Theatre of Scotland 'badge' this is a revival of a Royal Shakespeare Company production that ran in London at the start of 2010. Which leaves me feeling rather uncomfortable at the thought of a 'London' audience enjoying laughs at the savages up north. Perhaps I'm being overly sensitive - I'd certainly be interested to hear if anyone else had similar concerns. But even with that caveat, I'm pretty sure that in a week/month/year my memory of Dunsinane will simply be of a wonderful night at the theatre. Dunsinane has completed its run at the Lyceum and the Citizens. It runs at the Swan Theatre in Stratford-upon-Avon until 2nd July. Image by Richard Campbell used with permission.